The Tribunal, concerned principally with the claims of US nationals against Iran, is the most important international claims tribunal to have sat in over half a century. Its jurisprudence is bound to make a uniquely important contribution to international law and, in particular, the law relating to aliens. 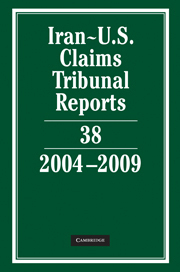 The series is the only complete and fully indexed report of the decisions of this unique tribunal. These Reports are essential for all practitioners in the field of international claims, academics in private and public international law and comparative lawyers, as well as all Governments and law libraries. Each volume contains a detailed consolidated index and tables of cases covering the whole series to date.